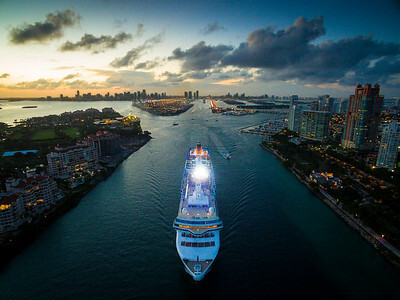 An aerial of a Royal Caribbean cruise ship heading out to see along the cruise channel between South Beach and Fisher Island. By the sound of EDM and the disco lights, the boat certainly was rocking and the party bumping! 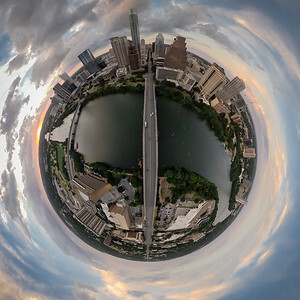 A tiny planet over Congress Ave Bridge in Downtown Austin, TX. 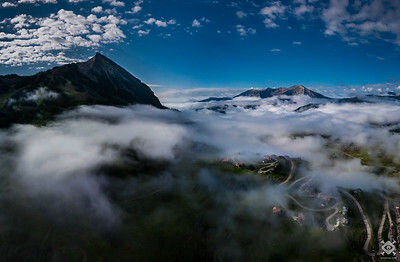 This image is a spherical rendering of a 360 degree panoramic shot. 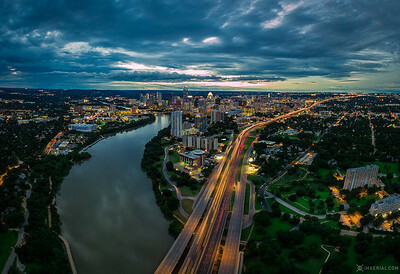 After weeks of heavy storms in Central Texas in June of 2016, I caught this 6-image panoramic of downtown Austin with my Phantom 4. f/2.8 ISO 400 @ 1"
This sunrise aerial shot (400ft) is of the Tower of the Americas, a 750-foot observation tower/restaurant located at HemisFair Park in Downtown San Antonio, TX. My Dad was part of the O'Neil Ford architecture team that designed the tower which was built as the theme structure of the 1968 World's Fair (HemisFair '68). The Tower was the tallest observation tower in the United States from 1968 until 1996, when the Las Vegas Stratosphere Tower was completed. 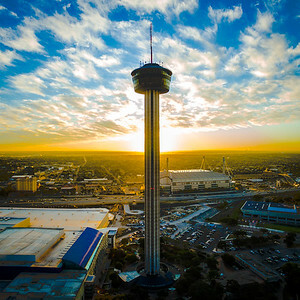 It is the tallest building in San Antonio, the 27th tallest building in Texas, and the tallest building in Texas outside of Dallas or Houston. 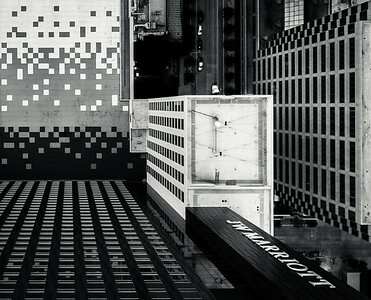 The Frost Bank Tower is a skyscraper in Austin, Texas, United States. 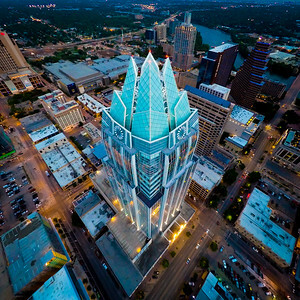 Standing 515 feet tall with 33 floors, it is the third tallest building in Austin, behind The Austonian and the 360 Condominiums. Doug Sahm Hill in Butler Park honors the memory of a musical Texas giant. Doug Sahm was a founding member of the Texas Tornados and contributed much to the Texas sound. He single handedly put Austin on the map and help make it the "Live Music Capital of the World"! 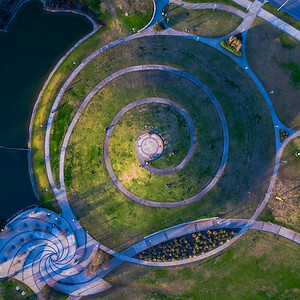 I particularly enjoyed the shadows cast by the sun and the people laying down on the grass looking at my drone hovering at 400ft. 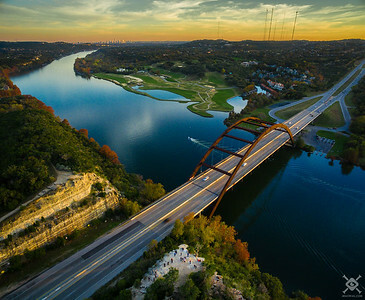 The 360 Bridge (aka the Pennybacker Bridge) spans Lake Austin on the Capital of Texas Highway, considered one of the most scenic drives in Texas. The bridge is 1,150 feet (351 m) long with a 600-foot (183 m) central arched span. 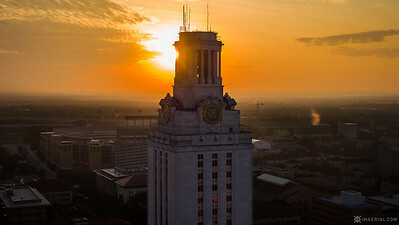 This sunrise aerial image of the UT Tower with the DKR stadium behind commemorates the hiring on new UT Longhorn football coach Tom Herman. Hook 'Em! 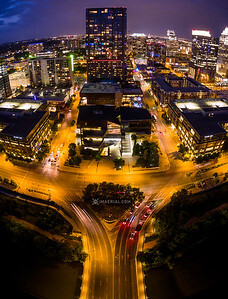 FLying above the JW Marriott in Downtown Austin. "I sure love the smell of" freshly cut grass "in the morning". 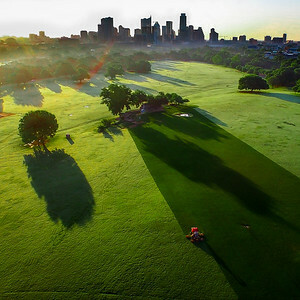 This was a nice bright morning to be out flying over Zilker Park. I really enjoyed the lines the lawnmower was making in the grass. 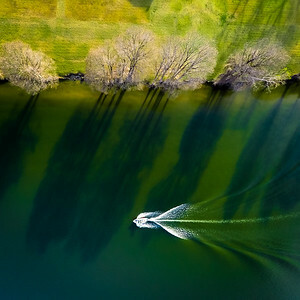 As the sun was beginning to set on a cold winter day, the long shadows cast by the trees along the banks of the Colorado River reached out to greet this lonely boater. (Full pic here: https://flic.kr/p/CYLDym) I captured this aerial dronie 360° panoramic (8-image stitch) shortly after some storms rolled through the vast planes near Maras, a town located 40 kilometers north of Cuzco in Peru in the Sacred Valley of the Incas. Needless to say I was pleasantly surprised to see a rainbow photo-bombed us way off in the distance! Maras is well known for its nearby salt evaporation ponds (seen in the lower left side) that’s been in use since Inca times. Though this photo does it no justice, thousands of uneven square-shaped ponds dot the slopes of the hillside less than a kilometer west of the town. These pre-Inca salt pools were constructed during the Chanapata culture between AD 200 and AD 900. Highly salty water emerging from the Qoripujio spring, close to the head of the valley, is directed into an intricate network of tiny channels constructed so that the water runs gradually down onto the several hundred ancient terraced ponds. Almost all the ponds are less than four meters square in area, and none exceeds thirty centimeters in depth. The flow of water is carefully controlled and monitored by the workers. The altitude of the ponds slowly decreases, so that the water may flow through the myriad branches of the water-supply channels and be introduced slowly through a notch in one sidewall of each pond. 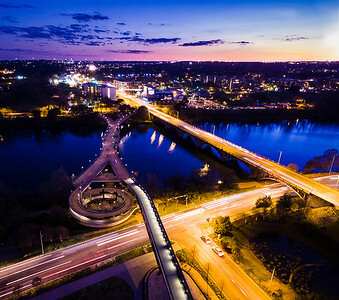 This golden hour shot of the 360 Bridge Overlook was taken over this first weekend of December. The trees were really beginning to show their fall colors and the weather couldn't have been better! There was a good crowd (pictured lower center) soaking in the stunning views of Lake Austin, the Pennybaker Bridge and Austin, TX in the distance. 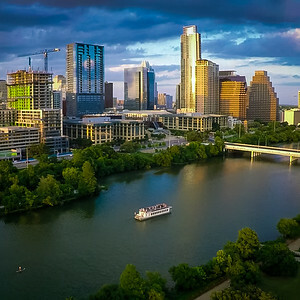 Austin is a booming city! This was captured over the summer of 2015 and was a great night to be out on Lady Bird Lake. A gorgeous Austin night for a riverboat cruise down Lady Bird Lake! 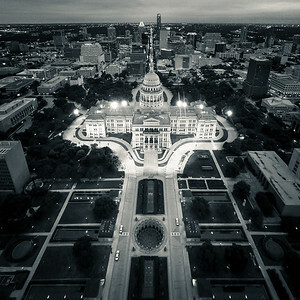 This is an aerial panoramic of the Texas State Capitol facing south with downtown Austin in the background. 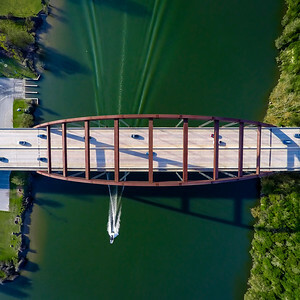 The Pennybacker Bridge (or more commonly the 360 Bridge) in Austin, Texas, is a through-arch bridge across Lake Austin which connects the northern and southern sections of the Loop 360 highway, also known as the "Capital of Texas Highway." The road is widely considered one of the most scenic urban drives in Texas, in large part due to this arched weathering-steel bridge and the rolling hills that flank the road. 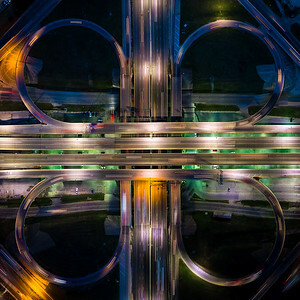 In 2001, 48,000 vehicles crossed the bridge daily. Ten years prior to this, 22,000 vehicles had crossed the bridge daily. 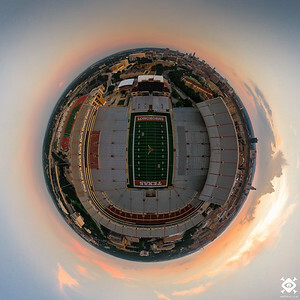 This 360° aerial panoramic of 'The Tower' was shot looking west on the UT campus. The 307-foot tall tower designed by Paul Cret of Philadelphia, was completed in 1937. Through the years, the Tower has served as the University's most distinguishing landmark and as a symbol of academic excellence and personal opportunity. It's infamous in that on August 1, 1966, Charles Joseph Whitman, an architectural engineering student at the university, barricaded himself in the observation deck of the tower of the Main Building with a scoped Remington 700 deer rifle and various other weapons. In a 96-minute standoff, Whitman killed 14 Austin residents and wounded many more. Police and armed citizens climbed up the Tower to the observation deck and shot Whitman to death. 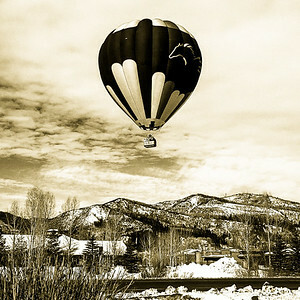 A low-aerial capture of a hot air balloon in Steamboat Springs, CO.
Part of the Lost Pines Forest in Bastrop, TX, these loblolly pines are unique to the region and suffered a massive fire in late 2011 that scorched over 34,000 acres. 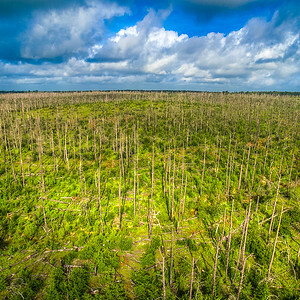 Much of the underbrush has grown back but the pines remain stripped and scattered thoughout the forest floor. 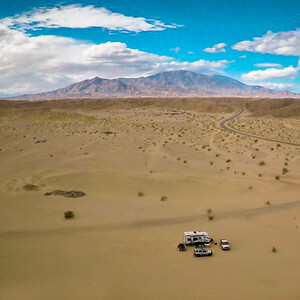 Just picture everyone's favorite bad guy Walter White cooking up trouble in the desert near the Salton Sea. 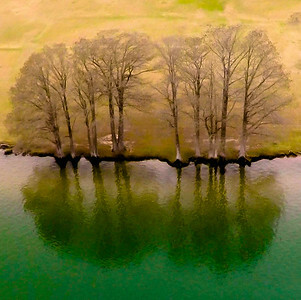 A beautiful symmetric aerial image of two trees in isolation along the banks of Lake Travis. Although it was shot in winter, the colors and reflections made for a special image. 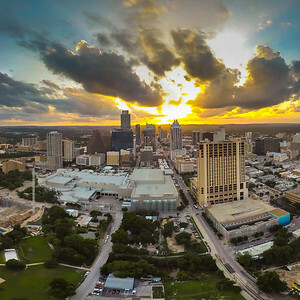 This cropped 360° aerial panoramic was shot looking west toward Downtown Austin. and was taken after several days of heavy storms in the area that produced record rainfalls around Texas. It was simply one of the most spectacular sunsets I had ever seen! 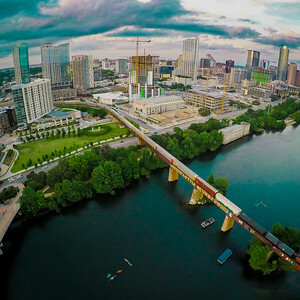 This 360° aerial panoramic was shot looking west toward Downtown Austin. and was taken after several days of heavy storms in the area that produced record rainfalls around Texas. It was simply one of the most spectacular sunsets I had ever seen!